We are incredibly proud of our horses and the work they do, not least because we are one of just a few forces across the whole country to have a mounted section. Our horses live at our police stables and each horse has his own stable and is named after a Lancashire town and the Queen's Jubilee and Preston Guild. We are known throughout the country for the quality of training our horses receive, including dealing with potential riot situations, fire hazards, and loud music. They help out at all sorts of busy events like football matches, protests and parades. Each horse wears its own "suit of armour" including head shields and shin pads for its own protection. There is nothing more reassuring than the sight of police officers on horseback! Aside from the dynamic and crime fighting aspects of policing, the Mounted Branch is by far the most approachable and family friendly department in the force and we are happy to introduce our horses to the public at any opportunity we get. We value greatly the effect our horses have on children and adults alike and they are a marvellous way to break the ice with everyone we meet. We accept visitors to the stables too, so you can get an opportunity to see what goes on behind closed stable doors! We do try to accommodate as many requests as we can but this is by appointment only or through winning competitions on our Facebook page. We are also happy to visit community events and schools so we can meet and mingle with the public as much as possible. If you see us out and about please stop us to say hello, we're looking forward to meeting you! 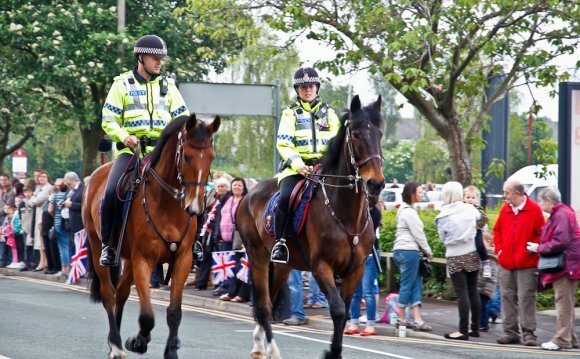 The Lancashire Police Horse Benevolent Fund has been set up to support our horses in their retirement. Their working life can start as young as four or five and they offer a loyal service for up to 15-17years, retiring at 20-22. Arthur Herbert Lindsay Richardson VC (23 September 1872 – 15 December 1932) was a British recipient of the Victoria Cross, the highest and most prestigious award for gallantry in the face of the enemy that can be awarded to British and Commonwealth forces.